With the advent of house Pets, there are many worries. Food is primarily of the main issues for the care of animals. 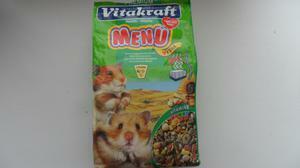 Hamsters belong to small rodents, but as any pet in need of quality food. What hamsters eat at home than eat hamsters in their natural habitat? Little Pets are very popular with families with kids. Fluffy hamsters often buy because they like the adults and children. Activity and health of small rodents it will depend on their nutrition and care. Correctly made diet affects the development of any pet. Today, all pet stores you can buy a variety of feeds for many types of Pets. They specifically develop, considering the needs of Pets. Despite this, many owners incorrectly feed the animals, which affects their health and life expectancy. To understand how to feed the hamster, you must know that part of their natural diet. It is known that for hamsters natural habitats are the steppes and fields. In this area, they dig burrows for shelter. They not only live, but also stocking up on food. The main food for those cute furry rodents — cereal plants. In winter months, these stocks are gradually eaten up, and in the spring of rodents forced to switch to protein foods of animal origin. 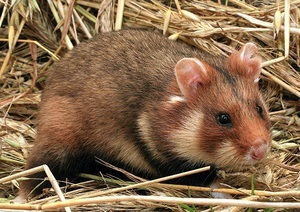 Rodents are of larger size and sometimes prey on small animals. Animals need different vitamins, so they eat vegetables and fruits — beets, apples, pears, carrots, and other common types. Judging by the diet in their natural environment, hamsters are omnivorous animals. They can be fed different food, but small portions. The biological mechanisms relevant in the home. Diet in the natural environment must be considered when planning meals for your hamster. In finished feed from pet stores include all the necessary ingredients — millet and oats, sunflower seeds and peas, nuts and corn. Poured into the trough such food can immediately determine that the pet loves the most. In the mix also often includes powdered greens, vitamin mixes and feed. You can buy them separately at a pet store, if they are not in the main feed for hamster. Specialists recommend to feed your hamster one kind of foodto which he is used to and loves. Upper and lower jaw of these rodents has features in the structure. They are large incisors without roots. They grow throughout the animal’s life. 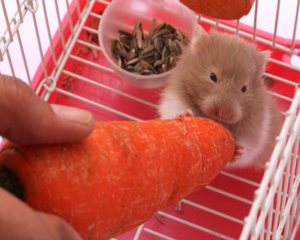 Because of such features of large incisors hamster needs to eat solid food. Due to this, the teeth can grow too large. Too large, the cutters will not interfere with him during the meal. Hamsters have cheek pouches in which he lays the food. During the meal the animal about 20% savings in the natural food pantry, and then in a secluded spot eats it. Hamsters contain at home is easy. However, after bringing home this cute little creature need to know the better and more useful to feed him. Homemade food does not differ much from natural eating. 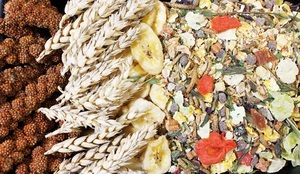 The basis of the diet should be cereals — buckwheat, oats, wheat, barley. And in the mix you need to add legumes — peas, beans, lentils, beans. Very often in of finished feed, add seeds of pumpkin, melon and sunflower. Good in homemade food to add nuts — cashews, walnuts, hazelnuts, chickpeas and others. Fresh herbs — binding additive in the daily diet. Mainly use parsley, lettuce, dill, clover, dandelion, nettle. Small rodents love to eat vegetables and fruits. They are necessary for the full development and growth of the pet. Fruits and vegetables in the diet will help to strengthen the immune system. In the winter it is difficult to provide such products, but you can give them dried. And also for power hamsters use frozen berries, fruits and some vegetables. From your home Desk you can’t give food to the rodent. I love hamsters what treats? The branches of deciduous and fruit trees in the spring. Hamsters love to chew branches of trees, which clean their teeth, and also saturate the body of the animal with vital vitamins and microelements. For the normal development of a rodent home needed protein food. The best option — chicken meat boiled without salt and spices. You can offer earthworms, shrimp meat. A good source of protein — eggs (quail or chicken). They can not be given more than twice a week. A good option dairy products — homemade yogurt or kefir 1% fat content. More fatty foods will cause a problem with the digestive system. If they occur because of these products, you can give the hamster congee, to restore the digestive tract. These cute animals in the daytime is almost always awake and active at night. In this regard, the main meal is in the evening. It is advisable to give food at one time, so the hamster accustomed to your schedule of supply. Cooked food in the feeder should always be fresh and balanced. In the evening it is recommended to give him porridge and a mixture of grain. In the evening you can also give a treat. In the morning it is better to offer lighter food, such as herbs and vegetables. 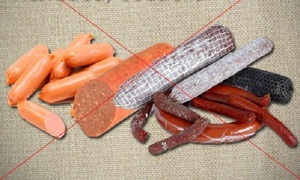 The great value has quality of the products that they were fresh and natural. Now we know that hamsters can eat, what foods they love. There are foods that belong to prohibited species. Every thoughtful owner needs to understand that not all foods will benefit your home the animal. These include fatty and salty foods, smoked and sweet dishes. And it is not recommended to give citrus and exotic fruits. Banned garlic, cabbage, onions, watermelon, potatoes. Before you enter into the diet of new meals you should consider, whether the hamster eats such food in their natural habitat. Than real food, the more benefit it will bring to the animal and he will be less health problems. In the cell in any animal should be drinking water. 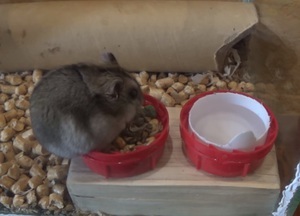 As for the hamsters, their food is dry cereal feed. In this regard, they need constant access to fresh water. If you give them fruits, vegetables and herbs rodents are not so willing to drink water. Despite this, drinking water should be regularly washed and filled with fresh water. And also, you should take care of that in a cage was a rodent wheel for Jogging. Sometimes a hamster being let out of the house, so he ran around the room under supervision. Such trips will help to avoid obesity when they become an adult. If you follow all the rules of feeding, the pet will remain in good health. He will be active, fluffy and beautiful.